The present investigation was undertaken to study the effect of in vitro exposure of Colo205, colonadenocarcinoma cells, to monocarboxylate transporter inhibitor α-cyano-4-hydroxycinnamate (αCHC) on cell survival and evolution of resistance to chemotherapeutic drug cisplatin. αCHC-treated Colo205 cells showed inhibition of survival accompanied by an augmented induction of apoptosis. 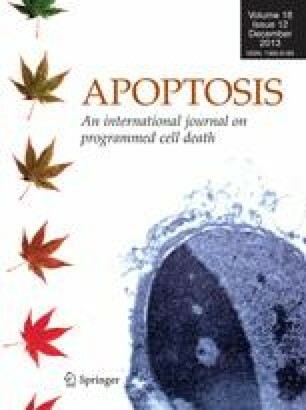 Changes in cell survival properties were associated with alterations in lactate efflux, pH homeostasis, expression of glucose transporters, glucose uptake, HIF-1α, generation of nitric oxide, expression pattern of some key cell survival regulatory molecules: Bcl2, Bax, active caspase-3 and p53. Pretreatment of Colo205 cells with αCHC also altered their susceptibility to the cytotoxicity of cisplatin accompanied by altered expression of multidrug resistance regulating MDR1 and MRP1 genes. This study for the first time deciphers some of the key molecular events underlying modulation of cell survival of cancer cells of colorectal origin by αCHC and its contribution to chemosensitization against cisplatin. Thus these findings will be of immense help in further research for optimizing the use of αCHC for improving the chemotherapeutic efficacy of anticancer drugs like cisplatin. The financial support to the School of Biotechnology from DBT, New Delhi, and Grants from Interdisciplinary School of Lifesciences, Faculty of Science and UGC for Grant of University with Potential for Excellence is acknowledged. The authors express gratitude to CSIR and DBT, New Delhi, for fellowship support to Ajay Kumar (09/013(0329)/2010-EMR-I) and Shiva Kant (DBT-JRF/2010-11/79), respectively. The help of Dr. S.D. Singh of Parul Pathology laboratory is gratefully acknowledged for some biochemical assays.